Humanists are people who think for themselves about what is right and wrong, based only on reason and respect for others. They find meaning, beauty, and joy in the one life we have – without the need for an afterlife. Humanists look to science instead of religion as the best way to discover and understand the natural world, and believe that human beings can use empathy and compassion to make the world a better place for everyone. 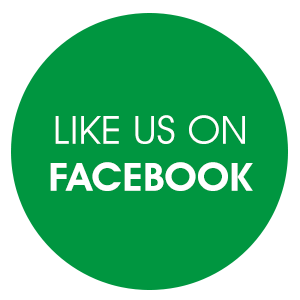 For over 100 years, the British Humanist Association has worked on behalf of non-religious people who seek to live ethical lives on the basis of reason and humanity. We promote Humanism, a secular state, and equal treatment of everyone regardless of religion or belief. Despite the number of people identifying as non-religious increasing year on year, and which now represents a majority of people in Britain, explicitly humanist or non-religious perspectives on contemporary ethical and moral issues are rarely heard in the media. Just one example of this is Thought for the Day, the daily scripted slot on the Today programme on BBC Radio 4 offering ‘reflections from a faith perspective on issues and people in the news’. Humanists and the non-religious have played an important role in shaping our laws and in championing human rights and a fairer society for everyone. It only makes sense that their views should be included as well. 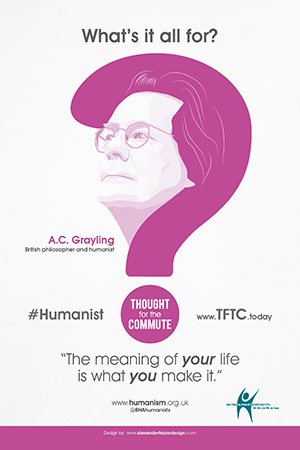 In 2014, we ran a campaign called Thought for the Commute, which presented four humanist perspectives on one of life’s biggest questions: ‘What’s it all for?’ The campaign encouraged everyone, whether religious or non-religious, to reflect on what helps create meaning in their own lives. 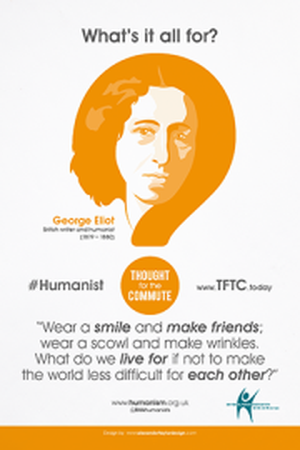 In September, posters featuring quotes and reflections from prominent British humanists – much-loved novelists George Eliot and Virginia Woolf and philosophers Bertrand Russell and A C Grayling – appeared in 100 London Underground stations over two weeks. 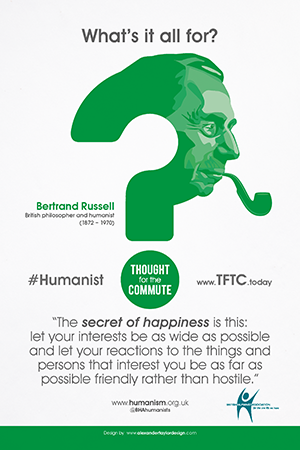 Then, for phase two of the campaign, Bertrand Russell was joined by novelist and comedian Natalie Haynes, India’s historic first Prime Minister Jawaharlal Nehru, and the physicist Jim Al-Khalili on 300 buses in Liverpool, Manchester, and Birmingham from four weeks in November and December. 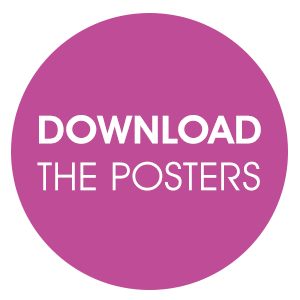 Please help to spread the message by sharing the campaign posters with your friends, family, and colleagues! Write to the BBC. 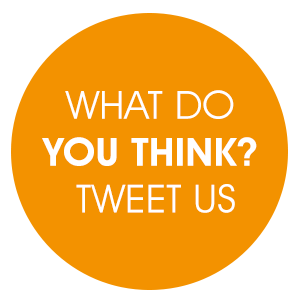 Would you like the BBC to know that humanists can weigh in on pressing ethical and moral issues? 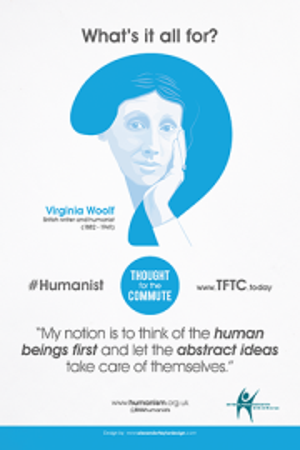 Then send them your own favourite humanist quote, and push for humanist voices on slots such as Thought for the Day. Humanists represent a large section of the license-fee paying public, and it’s time Thought for the Day took them seriously. You can write directly to the BBC using our system.